One of my favorite recipes to make is a type of cooked vegetables that I’ve seen called by several names; atakilt alicha, ye’atakilt wot. Here is how you make it. Heat olive oil in a skillet over medium heat. Cook carrots and onion in hot oil about 5 minutes. Stir in salt, pepper, cumin, tumeric and cabbage, cook another 15 -20 minutes, ( I cover it with a lid to keep it the moisture in). Add the potatoes, cover. Reduce heat to medium-low and cook until potatoes are soft, 20-30 minutes. 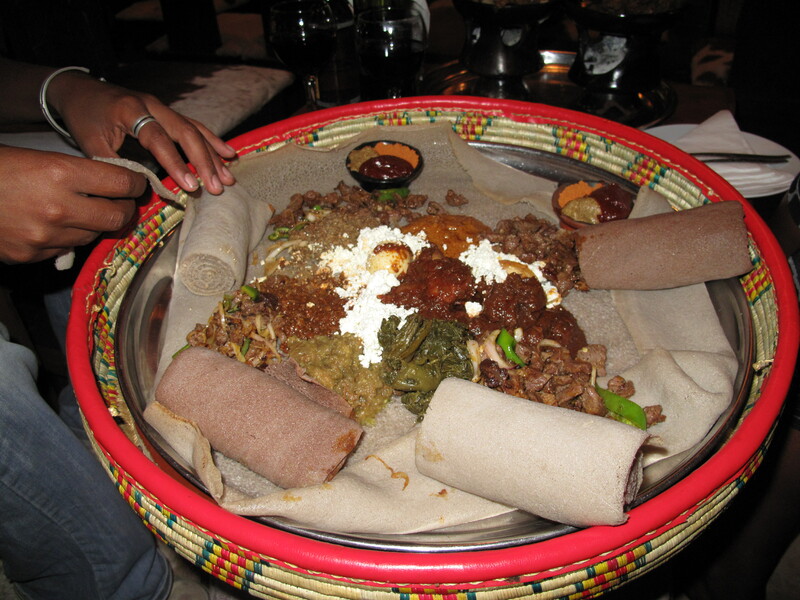 Serve with Injera and enjoy! About this time last year, my husband and I were flying to Ethiopia to finalize the adoption of our son. 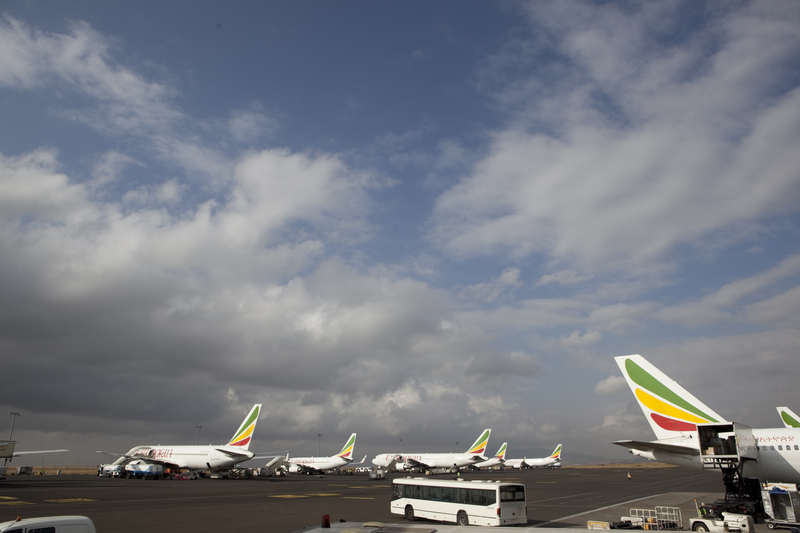 We flew direct from Washington, D.C. to Addis Ababa on Ethiopian Airlines. Although it is a long flight, we were glad it wasn’t prolonged by a layover in Europe. Their new Boeing 777 airplane was nice! There were individual screens on each chair so you could select your programs, the seating was more roomy than a lot of other airlines we have flown, and the staff was very accommodating. It was a great introduction to Ethiopia. We were able to stay in Ethiopia for 11 weeks between our Ethiopian court date and U.S. Embassy visa interview. During our time in Ethiopia we stayed at Ethiopia Guest Home. Ethiopia Guest Home is a group of 5 multi-story homes in a nice suburb area of Addis which is owned by American adoptive parents and caters to adoptive families and volunteer groups. The houses are nice, like a home in the United States, but I have to say that the greatest asset of the guest home is its staff. We had the opportunity to stay in four of the five houses while we were guests and spent time at the fifth house. At each house, we made friends with the staff and each house had something unique and great about it. We remain in contact with several of the staff that we made friends with, and I know of several other families that have made similar friendships. We had a great time exploring Addis and outside Addis and felt safe and comfortable with the Ethiopia Guest Home driver and guide that went with us everywhere. While we were at the guest home, we were able to let our son play in living room areas and outside on the lawn and the staff doted on him along with us. We wandered the neighborhood, visiting local shops and restaurants and the other guest home houses frequently and felt right at home in the community. Although I am sure I would have fallen in love with Ethiopia and its people regardless of where we stayed, our stay at Ethiopia Guest Home made it easy and comfortable to be in the country as new parents. I am thrilled to announce that Ethiopian Orphan Relief has received generous donations from both Ethiopia Guest Home and Ethiopian Airlines for our upcoming Lights of Hope Auction. Because of the specialized nature of these items, you need not be present at the auction to win. Contact Kim, President of Ethiopian Orphan Relief, at kim@ethiopianorphanrelief.org if you are interested but will not be able to attend the auction. She can explain how to enter a proxy bid. • a one-week all inclusive stay at the nicest suite available at Ethiopia Guest Home for up to three related adults and their children good through May 19, 2014 with no blackout dates. This includes 3 full meals per day for each guest, bottled water, daily transportation up to 50 kilometers, unlimited laundry service, internet access, cell phone use, and a massage for each adult. This is a great opportunity to support Ethiopian Orphan Relief while covering a necessary part of adoption expenses, and you can get an upgraded room that you might not have considered otherwise. It would be an awesome gift for an adoptive family in the process, too. However, you don’t need to be in the adoption process to use this trip, it would also be fun for someone who just wants to see Ethiopia or who has adopted from Ethiopia previously and would love to return. Please come to Lights of Hope on May 19th to bid on this package, or if you can’t attend and are interested, please contact Kim. 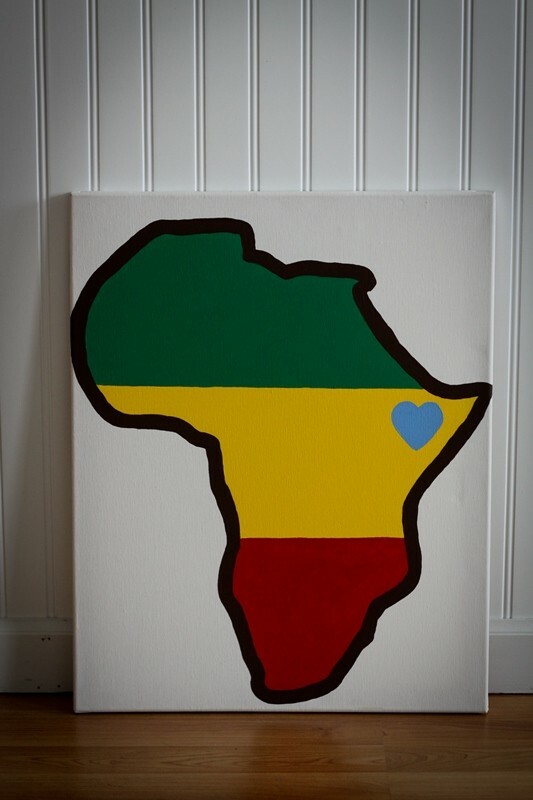 The Ethiopia Guest House/Ethiopian Airline donation is an item for Ethiopian Orphan Relief’s ( EOR) Lights of Hope Auction which is being held on May 19th in Portland. The donors, Ethiopian Guest Home and Ethiopian Airlines graciously donated these items to EOR . This item will be in our silent auction the evening of May 19th and the winner of the item will be the individual who is the highest bidder. If you are unable to attend the event you can enter a proxy bid and EOR will have a committee member acting as the proxy bidder on your behalf. This item is not a raffle or contest. It is a item in our silent auction and highest bidder will be the winner and payment would be made at night of event from the highest bidder. 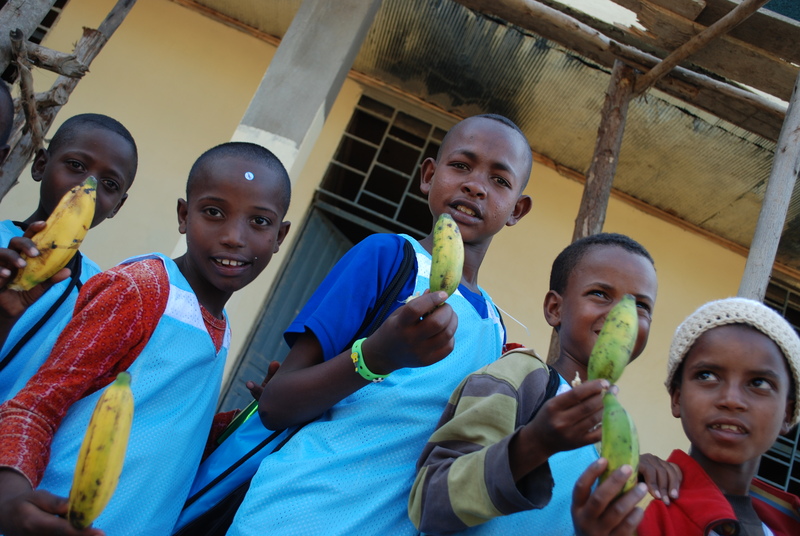 Proceeds from Lights of Hope will fund our current and future EOR projects in Ethiopia. Posted on January 11, 2012 by ethiopianorphanrelief under Adoption, Do Something! “labored” two years ago as we met her and prepared to bring her home. 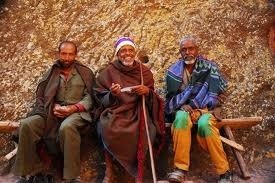 Ethiopia this fall, I was overjoyed and booked my ticket. nearly 200 bananas! 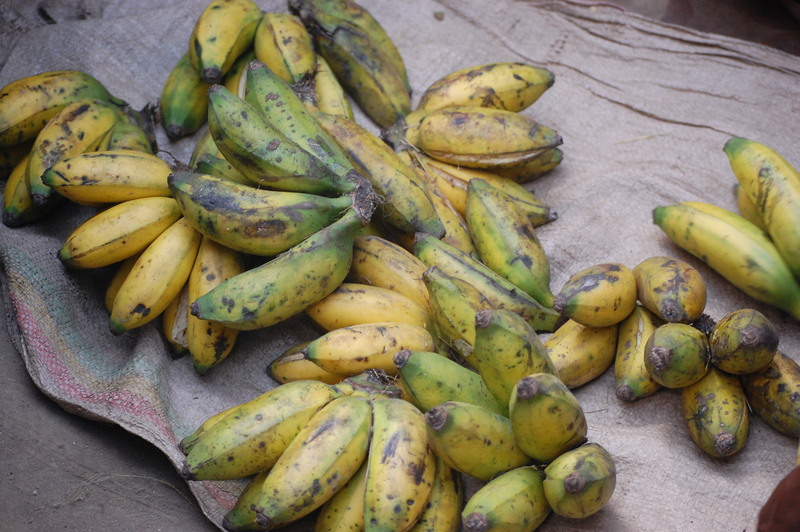 We purchased the bananas from a local woman. 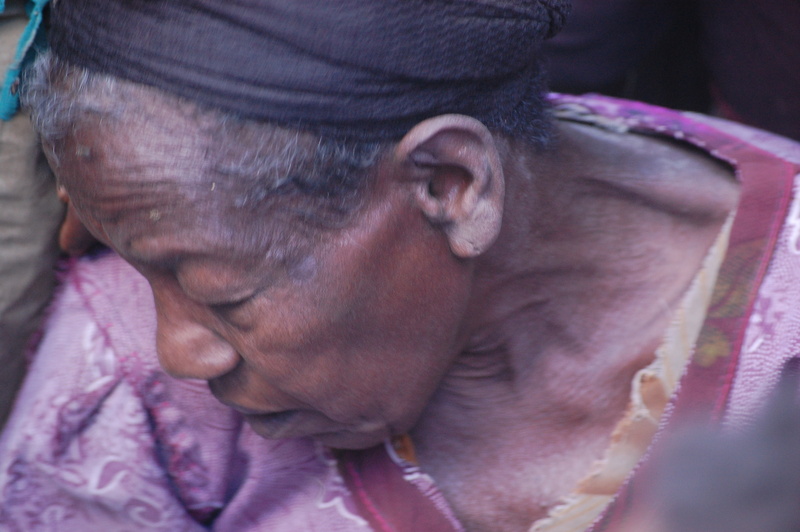 More than anything, what I learned in Ethiopia, is gratitude. 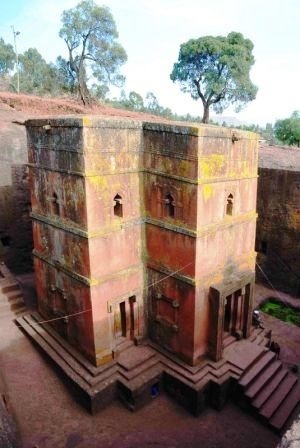 When my husband and I went to Ethiopia, we went north from the capital to Lalibela. 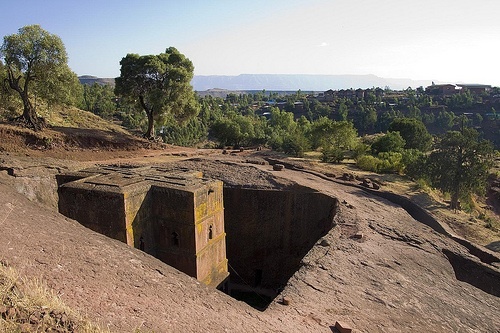 Lalibela is known for its rock hewn churches. Its a place unlike any other. While we were in Lalibela my husband and I met some local girls who invited us into their home for a coffee ceremony. I decided I was much too exhausted from jet lag to do this, while my husband, who apparently isn’t affected by jet lag was all ready to go. He went to their hut and experienced a typical Ethiopian family’s coffee ceremony. This is something our daughter would have experienced over and over again in her lifetime had she grown up in her Ethiopian family. He came back from the experience full of conversations about the girls’ dreams, life and school in Ethiopia. I can’t help but feel like I truly missed out on an experience that would have stayed with me forever. Did I know at the time that I would regret not going? I think so, however, I could barely form a sentence due to my lack of sleep. The point of this all is some of the decisions we make in our life are big, some are little. Regardless of size of decision, we need to throw off the bowlines and sail away from the harbor. Take a chance in your life and see where things go. Thinking about adopting? Go for it! Thinking about getting a puppy? Do that too! Thinking about trying a new lasagna? Now’s the time! For tonight your new thing could be actually voting for the classy awards for EOR. If you have been reading about them but not voting, now is the time. And while you are at it, invite all your friends to vote too. Or donate to EOR so we can finish building the home/school for FOVC-Ethioipia’s children. We only have $2500 left, so close, so very close. Think about your life and do something that challenges your notion of a normal day. Get involved, throw off the bowlines and set sail! Join EOR in our quest to make life a little better for the vulnerable and orphaned of Ethiopia. Buy a beautiful children’s book…Help us meet our goal! Adoptive parents, EOR enthusiasts and authors, Stephanie and Gur Tsabar, are helping us raise the reaming $3200 for the FOVC-Ethiopia orphanage compound through the sale of their beautiful children’s book, Friending Your Emotions. We are thrilled to announce that they will be donating $5 to Ethiopian Orphan Relief (EOR) from each sale of their book from now until our fundraising deadline on August 15th. 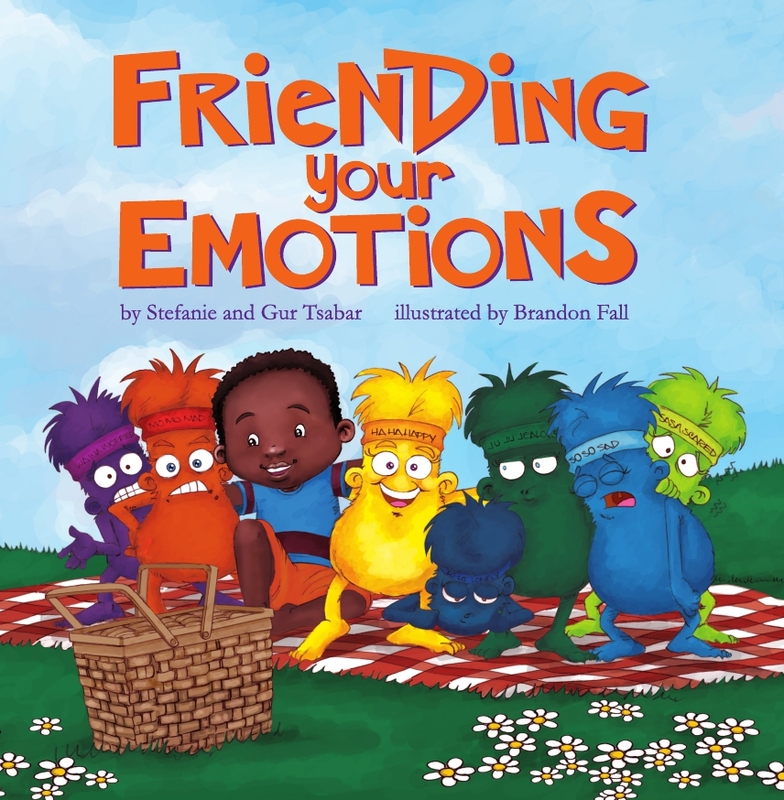 Inspired by their son, Abebe, who they adopted from Ethiopia in 2007, Stefanie and Gur wrote Friending Your Emotions for all the kids as a lighthearted way to open up a dialogue about their emotions. We love this book not only because it is so important for kids to learn how to accept and express their emotions early on in life, but also because there is a lovely passing reference to transracial families that we really appreciate. We know you will lov ethis book as much as we do! To buy a copy for your child or as a gift, click here, and please make sure to click on the EOR logo to complete your order. I just placed a order for 3 books. Two for gifts and one of my daughter. Thank you Stefanie for your generosity. 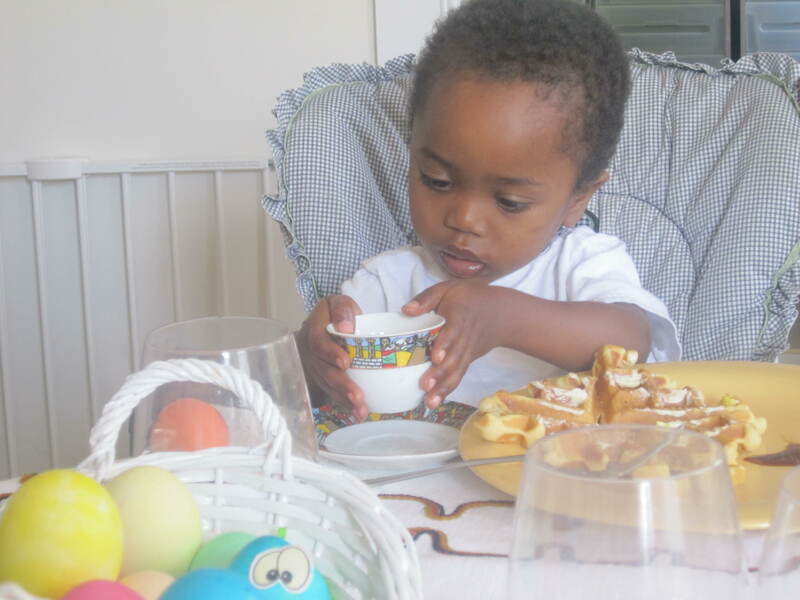 So the 3rd anniversary of my son’s adoption from Ethiopia came and went. Of course, this was a day of mixed emotions for me. There was the joy of celebrating my blessed family. There was the nostalgia I feel for Ethiopia (has it really been three years?). And then there was the grief and sadness I feel for the family and culture Eli left behind that day. That day when we took him away from the country in which he was born. The land in which he and would’ve otherwise grown and thrived (and I know he would’ve grown and thrived. He’s the strongest person I know). And the day that, even though he had been in an orphanage for several months prior to us meeting him, he would never have the chance to go back to his birth family. As much as I love him and am selfishly so incredibly over-the-moon happy to have him, I’m truly sad that he isn’t getting to grow up in his homeland. I’m devastated that he won’t grow up experiencing his birth culture on a first-hand basis. And I feel extremely guilty that I am getting to spend my life with him — and his birth family is not. I get to watch him grow and thrive and learn. I get to tuck him into bed and make him the perfect PB&J sandwiches and push him on the swings and have dance parties with him. And his birth family does not. Why me? Why do I get to raise him and not his birth family? In truth, it’s just not fair. Life just does not always seem fair. I wonder if there will ever be a time when Eli resents me for taking him out of his country and culture. I can imagine this day will one day be particularly difficult for him. I wonder how long it will be now. But on this past adoption anniversary, Eli was nothing but happy, happy, happy. He truly had a great day. He seemed to understand, as much as a three-and-a-half year old possibly could, that this was the anniversary of his adoption. That three years ago, mommy and daddy met him in Ethiopia. To honor him, we had some of our best Ethiopian buds (the fabulous Amy and Paige and their families) over for a cookout and some slip-n-slide. 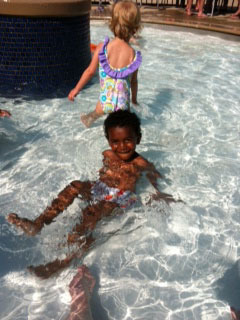 And then, later in the afternoon, we took him to the neighborhood pool. Eli never stopped smiling the whole day. Wow. What my three-year-old was telling me was that he was thankful on this day. And that’s how I should handle my emotions as well. By being thankful for the blessed opportunity to raise him … thankful for the opportunity to bring HIS culture into MY life … and thankful to his birth family and their sacrifices. Next week, our family will celebrate Eli Day. Eli Day, as you may have guessed, is the anniversary to the day we adopted Eli. Next Tuesday, it will be three years since Sr. Lutgarda of Kidane Mehret Children’s Home handed me the tiny, innocent baby with eyes wise beyond his years. There are way too many thoughts and emotions that run loose in my head and heart surrounding Eli Day for me to put into type at the moment. I’ll save that crazy, long, disjointed post for Eli Day (when they’ve all come rushing out). Right now, I’m just trying to remember what my life was like three years ago today — before Ethiopia. I can barely remember anymore. What did I DO before I became a part of an Ethiopian American family? What did I think about and care about so much before I fell in love with Ethiopia? I really don’t remember. He has gained a pound and a half in the five weeks he has been here. More weight than he gained in Ethiopia from June of 2010 to February 2011. His skin is smoother, his eyes shine, he laughs easily and is good natured most of the day. He sleeps well, is learning English at a truly spectacular rate and he meets each new day with a sense of joy and anticipation. He is an all around wonderful and wonderfully capable little boy. We entered a beautiful old brick building and were met by the teacher, a thin pretty woman in her late 40′s. She smiled sweetly and I believe we both felt calmer just being near her. Dawit didn’t hesitate to walk in and was as thrilled as I with the beauty of the space. A large room made homey with curtains on the windows on either end of the space. There was a wall of mirrors and opposite that was a wall of pegs hung just where a child could easily take one of the scarves that was hanging from them. The floor was covered with mats and then foam pieces in various shapes. There were objects to sit on, crawl under, and fall on top of. There were shapes to beams to walk across. She invited Dawit to walk on the balance beams and the circles and to hang from a swing and fall onto the blanket that was stuffed with beach balls. I felt a catch in my throat when she said this and thought I might cry. I was surprised by my reaction but perhaps shouldn’t have been. Having spent the last five weeks wondering if there was anyway Dawit could have stayed with his family, I was constantly coming up with a list of things they would have needed; running water, a school, medical services, to name just the very basics. Now, when looking for a toddler dance class I end up with a dance therapist. I was struck by the difference between what his Ethiopian family lacked and by what were provided with without even looking for it. A few weeks later he is sleeping through the night, eating most of what we offer him, learning his third language, and when asked to, dancing a solo (yes, each child danced a solo on a lovely asian carpet with a scarf in hand and has latin music played and we all sat watching in wonder) in front of strangers. He shares his toys and food and laughs with joy and irony when we do something funny. We are failing our Dawits when we as a world cannot ensure that everyone has clean drinking water. When children cannot go to school because they have to work and when mothers die and leave an infant so bereft that infant will not eat but instead cries on and on. We are the failure. So, that is what I learned today. I banish failure to thrive from my vocabulary. Failure to provide. That was the problem and that should not ever be. 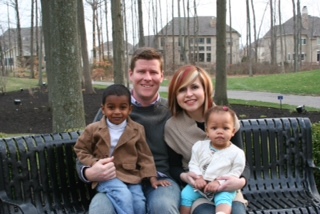 In November of 2010 we returned to Ethiopia for our second adoption. We were very busy and the time flew by. 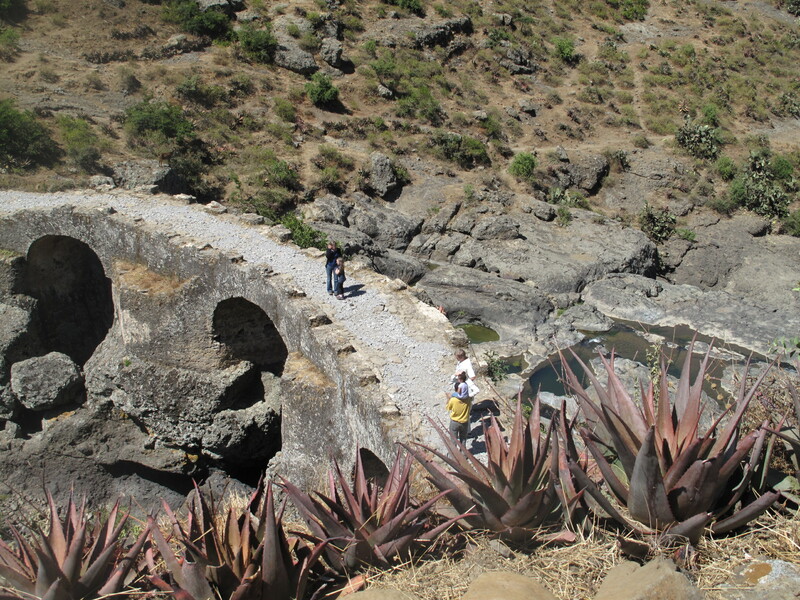 We visited places we hadn’t the first time we traveled to Ethiopia in 2008 and Debre Libanos was a place I am so glad we went to. 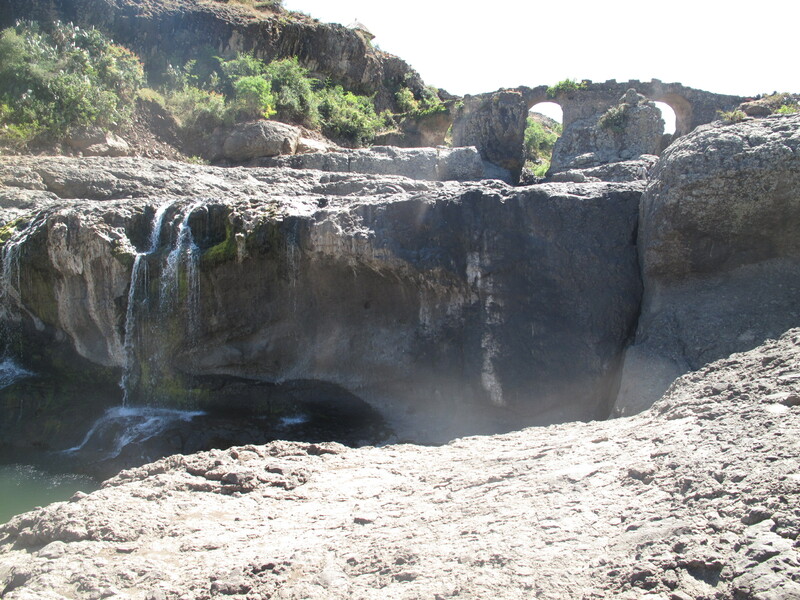 It was on day 9 of our trip and after having to reschedule several times, we were finally headed to Debre Libanos. I was so excited to go. 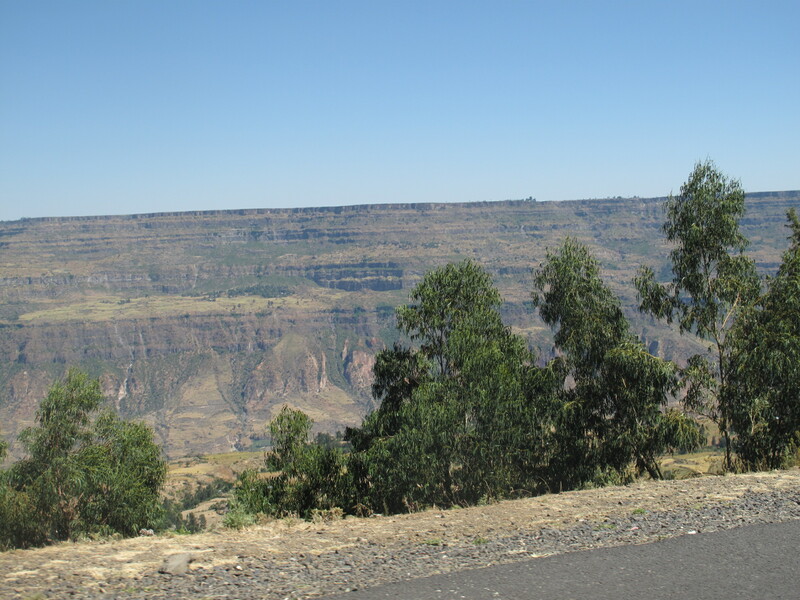 Debre Libanos is just a short distance north of Addis Ababa and would be only a day trip, but once you leave Addis Ababa the scenery changes so much. The land is open with hills, patches of eucalyptus and toukouls. You see shepherds with their cattle, horsemen riding and people carrying wood, water and other things along the road. 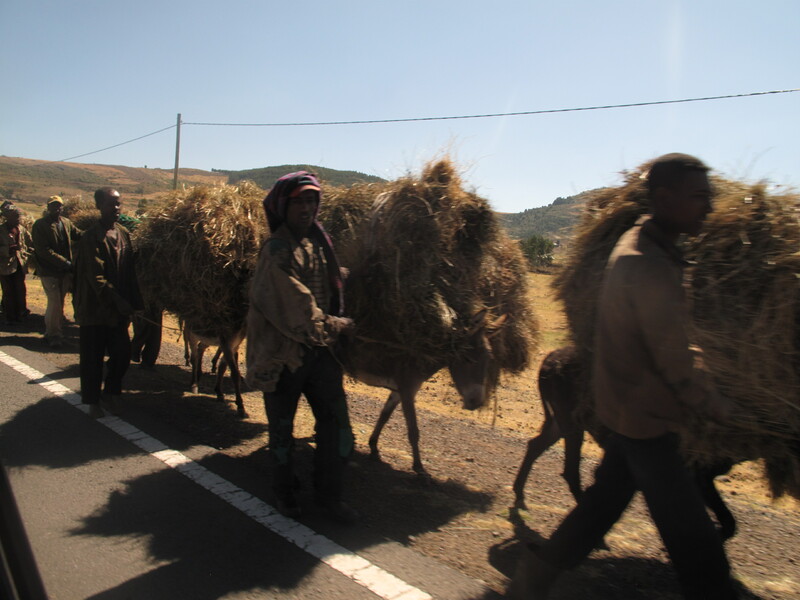 We passed thru smaller towns, the land all looked very dry until we neared Debre Libanos. As we got closer we noticed more trees and the caught and impressive glimpse of the Blue Nile Gorge. We drove on to the monastery. 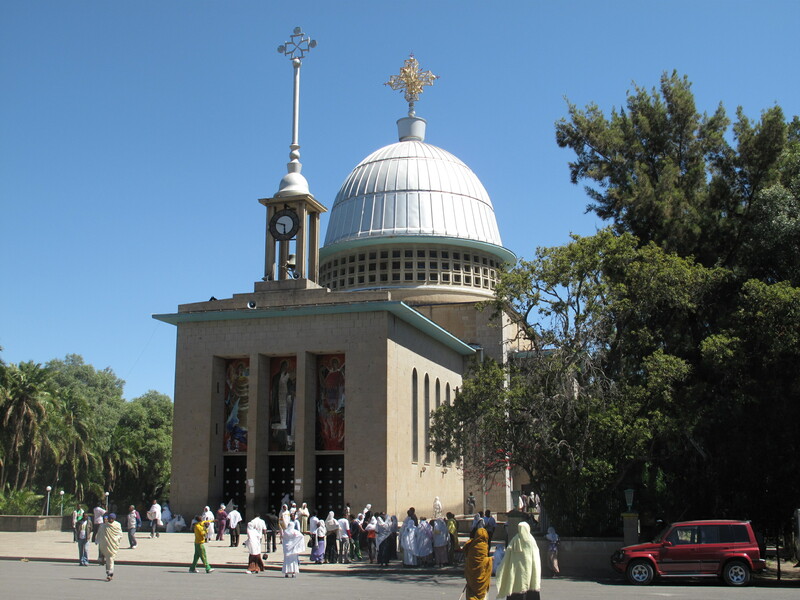 Considered by the Ethiopian Orthodox Church to be one Ethiopia’s holiest sites, the original monastery was built in the 13th century but was destroyed and later rebuilt by Haile Selassie. we could hear wind and water. We kept on going and arrived at a top pool where a goat ignored us while it drank the water. Then we climbed down to a waterfall and stopped for a while to take in the view. When we finally hiked back up we stopped for a drink at a restaurant at the top, owned by a couple who live there. I am so glad we were able to go there. This was definitely one of the highlights from our time spent in Ethiopia. All three kids had a great enjoyed it and I hope the memories will last for them too. 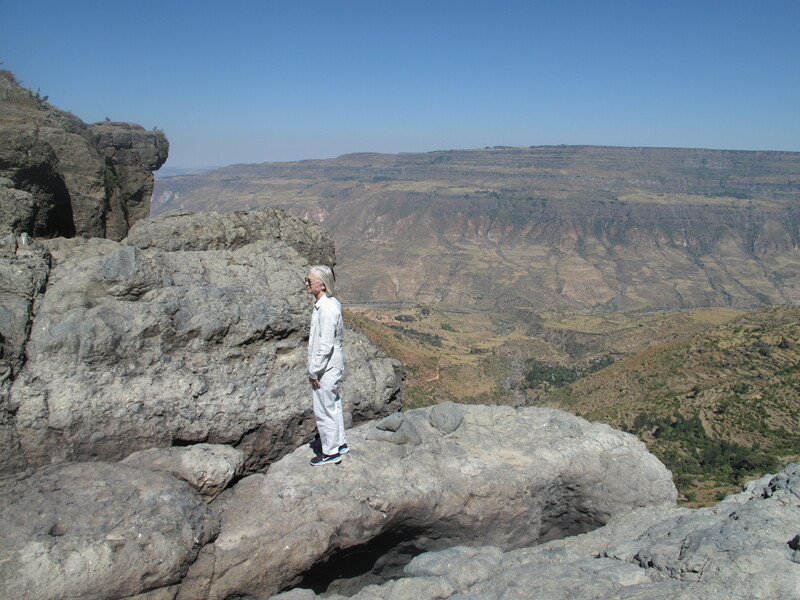 Ethiopia is full of beauty and has such a long history, I look forward to returning. “Yup!” He said proudly. “Just like me!” And he gave me the thumbs up sign. Recently, I’ve been beefing up my adoption conversations with Eli. We’ve been looking through his baby book and talking about Ethiopia, the (age-appropriate) factors that went into his adoption, and how we became a family. Right now he seems SO proud to be from Ethiopia (and the only one in our family from Ethiopia to boot — it seems to make him feel all the more special). But I worry constantly about this changing — especially in the face of the comments we sometimes get when we go out. Now, I’m not angry or complaining — I knew well before we became a transracial family that we would get the occasional questions, comments and stares — but it is difficult when well-meaning people make comments in front of Eli. Especially because he’s at a very sensitive age where he understands a lot … but also not a lot. Maybe you would’ve responded the same way I did … or maybe you wouldn’t have. Every commenter, every comment, and every instance are different, so I never really have a “catch-all” response to just recite. But I really try not to embarrass the commenter, no matter how much they’ve just embarrassed me. Instead, I usually try to create teaching moments if the situation lends itself to that. And, above all, I always try to advocate for my kids. Sometimes, though, it’s hard to find responses on a moment’s notice. One thing I really want people to know — more than anything else — is adoption is not a charity thing. It’s a family thing. My husband and I adopted Eli and Ryan to change our family — not the world. Not that I don’t want to do “truly wonderful things” for people – just like the lady at Wendy’s said. Of course I do. But there are other ways to do it. Like by going to Ethiopia to help build shelters and school facilities for orphaned and vulnerable children. Or, if you’re like me and you WISH you could do that but CAN’T realistically right now, then by SUPPORTING THOSE WHO ARE THERE – groups like Children’s Heaven and Friends of Orphaned and Vulnerable Children (FOVC). Children’s Heaven runs a much-needed center for girls who have been orphaned or are at risk of being orphaned due to AIDS, and FOVC is working hard to build a new shelter and school for more than 150 children who need a roof over their heads. These are the people who are in Ethiopia right now – getting their hands dirty, dedicating their lives to helping those who are in the most dire need. But they can’t do it alone. Even though we can’t be there with them physically, we can help just as well by supporting them. YOU can do “truly wonderful things” for people. No matter where you are, or what you’re doing with your life, YOU CAN HELP CHILDREN IN NEED – by clicking here.